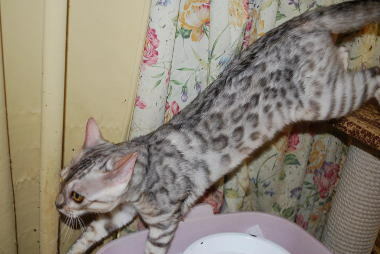 She arrived at my home from the UK on October 28th, 2009. And her glitter is sparkle. 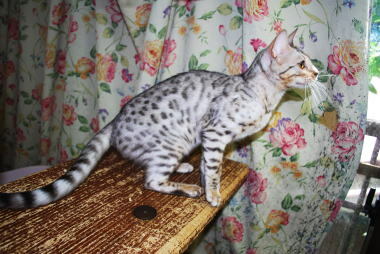 Dark black marking, the rosettes are very nice. 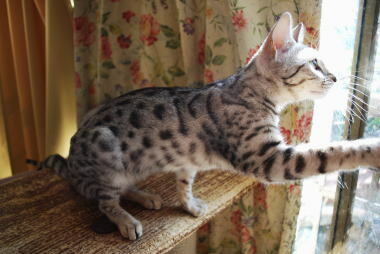 Her profile is very wonderful. And the marking of her jet black is beautiful, too. 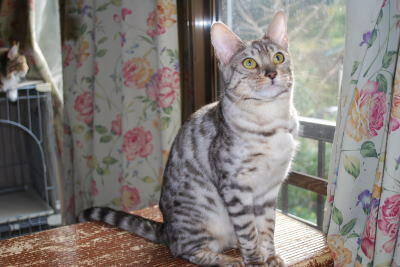 She is very splendid silver Bengal. 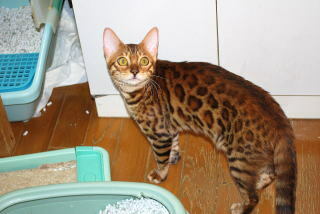 She's temperament is very nice. Besides her rosette, glitter is so beautiful. 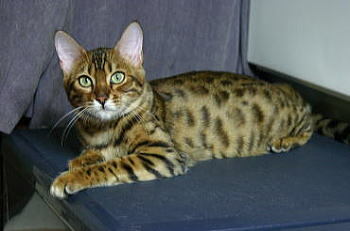 She is so beautiful bengal. 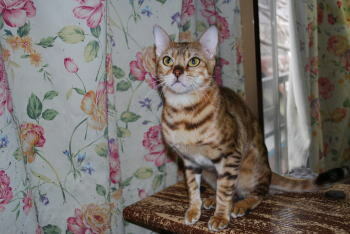 She arrived at my home from Maui Bengals of Hawaii on June 3, 2005. I think that she resembles the father. 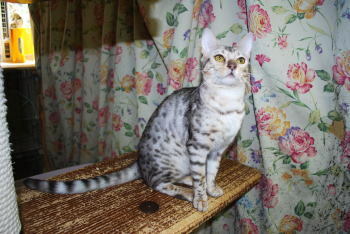 She has very beautiful rosettes and glitter. And she is very friendly and lovely. She sometimes made my leg the pillow and is sleeping. Moreover, She appeals against the I back follow and play together. STELLA MARIS means the star of the sea in English by the name which praises ancient goddesses. She is called STELLA. She has grown to be still more beautiful lady. And I hope for her very much. 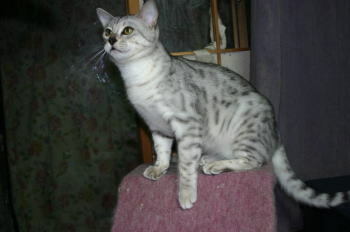 Charlotte took the long trip and arrived at my home from UK on September 8th, 2006. 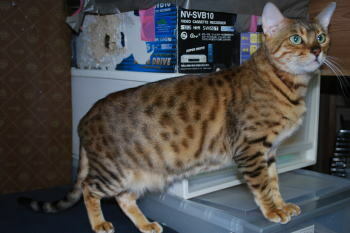 She has a very beautiful coat like silk. And she also has glitter, it's sparkle like platinum, and has rosettes. Her grandfather is world famous OS IW RW SGC Bridlewood A License to Thrilld. She is a very good disposition. I will expect her very much. She is the MILLWOOD line that She has very beautiful rosettes and glitter. 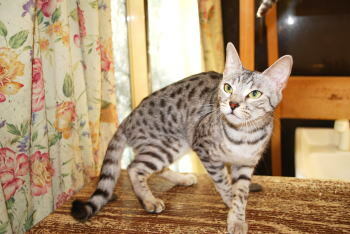 She is very active and friendly character. 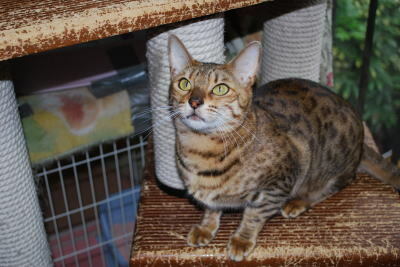 And she is very sweet and lovely. She will also grow wonderfully increasingly. Moreover, the race is always carried out together with STELLA. FLEUR SOLEIL is French and means the flower sun in English. 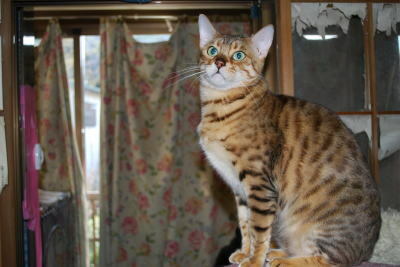 I hope also for her very much. 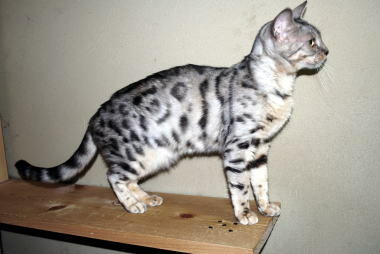 She has like a small arrowhead spots, And has glittered coat of a silky touch. 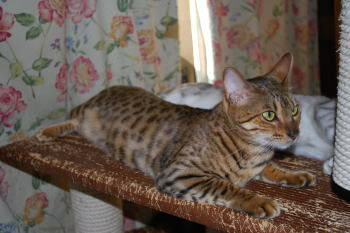 She is very active and is tomboyish. 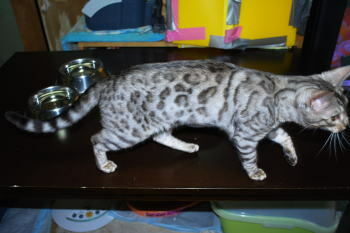 She has beautiful black spots and a splendid glittered coat. And the coat is a silky touch. 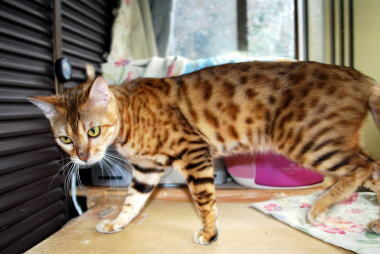 Temperament is very well active, and she is so beautiful. 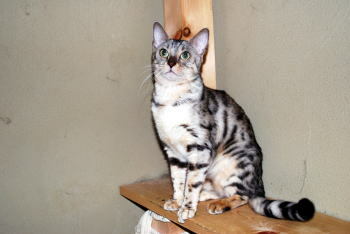 She took a long trip from Scotland on September 9th, 2008 and arrived. 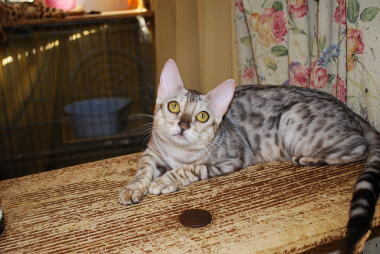 with her huge rosettes on a clear glittered coat like a platinum. 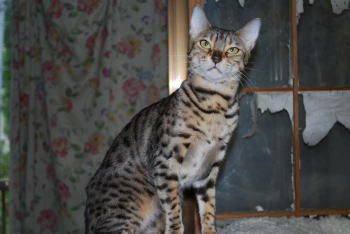 Her temperament is very splendid, too. We expect it to her kitten very much. 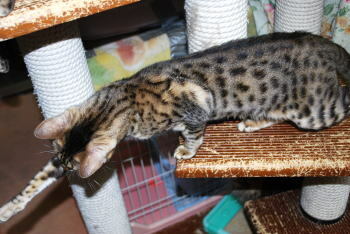 As for her, a funky marking, a beautiful silky coat are so wonderful. 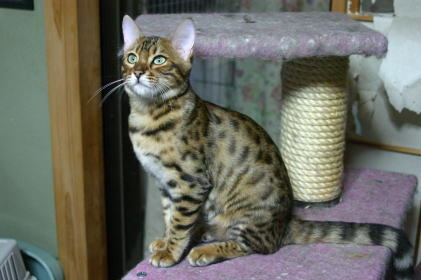 and small ears,　She is splendid. 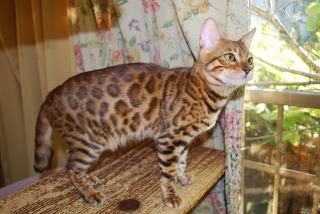 She has wonderful profile and high glittered coats. 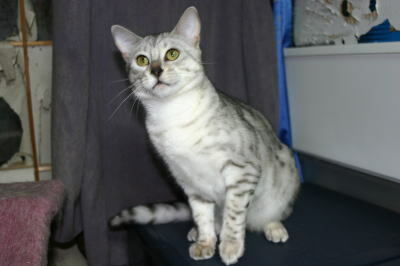 And rosettes, she is beautiful silver Bengal.